Know your place: landscape interpretation for outdoor practitioners Dhermi, a landscape to remember! Another political aspect that has influenced in this landscape comes from communism times. “One of the most talked about features of the Albanian landscape is the omnipresence of concrete bunkers: 700.000 in likely and unlikely locations throughout Albania” (Susan, 1998, p28). The bunkers were a classic highlight for tourists coming to Albania and it was something unique. 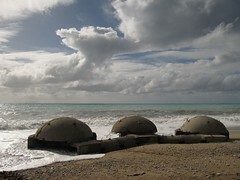 These bunkers made of concrete were built by the former dictator Enver Hoxha as defensive measures against possible invaders coming at the Albanian coast. ...and it gives you the impression of a defensive wall of bunkers, which was also the reason of building them. There are many ways these constructions have influence in landscape. First of all many of them lie in the beach and with the passing of years they have started to sink in the soft sand, they are subject of gathering rubbish and other types of waste. So in a way they destroy the beach and make it a dirtier place. 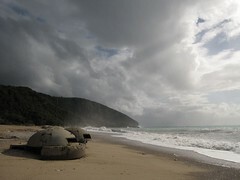 It is true though that in some places along the Albanian coast, some big bunkers have been turned in coffee bars. These were a few points on how politics has influenced in the changes of landscape in the last 20 years. I want to mention now some social or cultural reasons which in my opinion are to some extent connected to the by political ones. Even though they are committed by people of the area, they are somehow initiated by the changes in the political system. Among all others I want to emphasize something which I have witnessed myself, a change of landscape or better a ruin of the landscape. This, in my opinion, is the cause of political and social influences together. In the next photos you will see to what I am referring. This is a picture taken from the boat on 2003 and it shows the bay which I am talking about. The bay which I am talking about has always been a nice small bay where people could go and relax. It is the same place shown in the previous picture but different. As you can see the rocks have slide down ruining the small nice beach and the small caves do not exist anymore. Many people don’t know that landscape is a natural system very important for life on earth and important for people as well. By not knowing this they act without thinking that they are actually damaging the landscape and environment around them. The change between the two photos or better saying the destruction of the small bay is caused first by human action and second by governmental non action. In the process of building new cabins and other types of building in that area, in the last 10-15 years people have been collecting sand and gravel from the beach. They were obviously doing it in small faraway places like the small bay in the photo. After taking a considerable amount of sand and gravel the salted sea does the rest during the winter when the tide is higher and therefore the bay almost disappeared and the rocks fell on the beach. To many people it is not relevant and important what happens in the small bay and they don’t understand how landscape is connected with their life in that area. If they continue to make use of the landscape in order to increase their profits they will soon see their profits decreasing. In certain areas like the one we are talking about,tourists and visitors are attracted solely by the beauty of the landscape and environment. If with the passing of time natives will continue to destroy their landscape soon there will be no tourists to support their businesses. It is said that landscape reflects the culture of the people living in that area and it was like that before the last 20 years for this landscape. It was wild, untouched, and beautiful but this changed in the last 20 years. More and more people came in that region and in that village and they started to change their surroundings according to their needs. This happened to the stream coming from the mountain, going through the forest and finishing in the sea. I remember when I was there about 12 years ago that the stream was full of water and you could hear the water gurgle in the middle of the forest. It was also a good thing for the vegetation around and a very beautiful part of nature. Today if you follow the stream through the forest you will barely find some water flowing in it. People blocked the stream further up in the mountain so they could take the water for their purposes like building, for water resources and using it in different new buildings as everyday water. This is of course a human cause to the environment and to the beauty of landscape. It is something illegal to use the water of the stream for business purposes but this is still continuing nowadays and seems like it is not only a social fault, but also a governmental fault. The natural and physical attributes of the landscape have been changed directly and indirectly. This way it is easy to project this landscape in the future but looking that the reasons that cause this change are of different nature, political, social and cultural, the future is even more uncertain. I can say from my experience and from knowing the political and social situation in my country that this landscape has already entered the future. It is true that for the moment the situation on that area is not good, and many parts are covered with rubbish or are not cleaned by the natives themselves, but I have been thinking of a number of reasons why this situation will change.